Where to Go For China Tour? When to Go China for Travel? Home > Trip Ideas > Traveling in China > Where to Go For China Tour? Stretching more than 3,000 miles from the western shore of the Pacific Ocean across the face of Asia, China is a country of unlimited size and variety. This vastness not only adds to the excitement of planning a trip to the country, but also to the confusion of which cities and regions to visit first. When planning a trip to China, be aware that you can't see "everything" in one start-to-finish, whirlwind trip, but if you want to fully experience the country, allow enough time to really experience it. China is definitely the kind of place you will never feel enough to travel only for several times. It is best to visit the major sites and cities on the first trip, at a relaxed pace, then plan to explore the country region by region on subsequent trips when you can experience all the different ethnic minority cultures and archaeological wonders. Keep in mind that China is a land of extreme climatic variations. For example during February you can travel the southern coast and enjoy tropical fruits, sunbathe on the beaches of Hainan Island or visit the Flower Festival in Guangdong. At the same time, in the north, Harbin is dazzling travelers at the annual Ice Sculpture Festival with giant ice pagodas, ice palaces, and cleverly sculpted panda bears. Meanwhile, Beijing is celebrating the Longqing Gorge Ice and Snow Festival with illuminated ice lanterns, spectacular fireworks, and ice fishing. 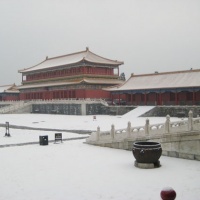 Witnessing the grandeur of the Forbidden City in the snow is an extraordinary sight indeed. Dynasty Tours - Beijing, Xi'an, Luoyang, Kaifeng etc. Splendid Tours - Tibet, Silk Road (Xinjiang), Yangtze Cruise etc. Ethnic Minority Discovery - Yunnan, Guizhou, Sanjiang etc. Natural Tours - Guilin, Zhangjiajie, Jiuzhaigou, Chengdu etc. Mountain Tours - The Yellow Mountain, Wuyi Mountain, Wutai Mounain, Emei Mountain, Jade Dragon Snow Mountain , Xiling Snow Mountain etc. Beach Tours - Hainan, Dalian, Xiamen, Qingdao etc. City Tours - Tours to cities around Shanghai, Beijing etc.